Leigh Community Art Group: Last Chance to Buy A Unique Christmas Present.! The Community centre is just off A572, Simpson Road, which is just off the East Lancs Road. There is ample parking across the road from the centre. See map -Please note the map shows a point 100yds past the Community Centre. We will be there between 9.30 a.m.and 3 p.m. Forget buying some rubbish aftershave or chocolates at the last minute! Treat that special person in your life to something unique at a very reasonable price and get double brownie points at the same time. If anyone sees a style they like then many of our artists are willing to accept commissions at very reasonable rates. We hope to repeat last months success with over a dozen artists are expected with over 200 paintings on show. 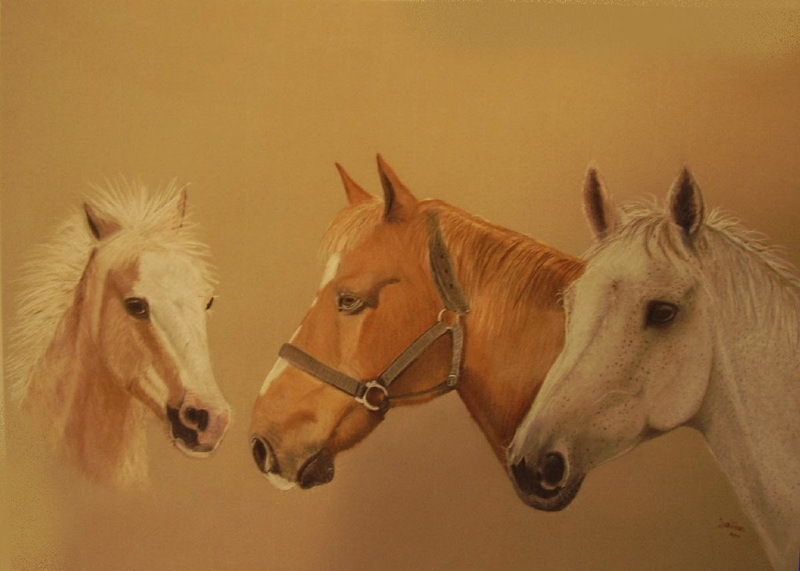 which is "3 Horses", in pastel.